The Sole Fitness brand is highly rated by many in the US market and has gained the endorsement of Hilton Hotels for ‘in room fitness equipment’. Since launching in the UK market, Sole have started to build quite a following and having reviewed a couple of their cross trainers so far, we’ve been relatively impressed. In this review, we’re putting the E35 incline elliptical through its paces to see what it’s really like! Assembly first!…and you’ll be glad it’s the first and LAST time you have to do it! Although it’s not too complex, it is certainly a bit fiddly in sections and time consuming overall. However, there are 2 things that help the process. 1. The instruction manual is well written. The advice here is please READ it! If you ignore that advice and try to ‘wing it’ you’ll inevitably go from scratching your head to pulling the hair out of it! Fortunately, the instructions are clearly spelled out, taking you step by step through the process, with helpful pointers along the way. Another tip for assembly would be looking through the rather helpful assembly videos on the Sole Fitness UK website. The second thing to help you is the build up of ‘anticipation’! As the parts go together, you start to become aware of the quality of the machine you have in front of you and it becomes clear that the end result will be well worth a little effort! As part of the testing process of any review, the equipment has to undergo a rudimentary ‘shake test’ to ascertain how sturdy it feels. Judging by the imposing bulk of this 105kg machine, we weren’t surprised that it wouldn’t budge! Sole are rather proud of their reputation for outstanding build quality and in our experience of the times we have tried to ‘rattle’ their products we must say it’s a reputation that’s well deserved! In the case of the E35, it’s been built like a tank! 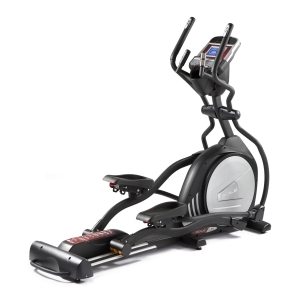 Here is an elliptical with a maximum user weight of well over 26 stones and backed by a lifetime guarantee on the frame, the motor and the parts!! Plus if anything should go wrong in the first three years you are covered by an on-site labour warranty too. That is the type of warranty that should give complete peace of mind to the Sole customer, and maybe cause some concern in the minds of Sole’s rivals. In comparison with the typical cover offered by most manufacturers, we think it’s time for the competition to sit up and pay attention! When it’s time to climb aboard, it’s obviously always best to hold on to the handles and step onto the pedal in the bottom position but it’s a refreshing change for a machine to feel like it won’t crack under-foot if your inadvertently step on the bodywork. The pedals run smoothly on 3” concave rollers which travel up and down double guide rails that are spaced apart by 9cm(on centre) giving extra stability to the footplates. The footplates themselves are something rather special. Firstly, they have the usual Sole design of having a natural 2 degree inward slope but best of all, they are adjustable. For anyone who relishes the ‘low impact’ nature of elliptical training due to having sensitive knees and ankles, then this is a God-send. For everyone else, having the option of 3 positions of adjustment to ensure minimum heel-lift and stress on the knees, is just as important! During countless product tests, our review team has got mixed findings when experiencing fixed elliptical motions. Obviously not every design suites the biomechanics of different body shapes and sizes but with the E35, a quick pull of a spring-loaded pin at the rear of the pedal, the angle can be locked in one of the 3 positions. Another important consideration is the stride length of 20”. This is a big selling point for most users (over 5’3”), but as we’ve established, when there is no provision for adjustment (which there isn’t on stride length) then it may not suit everyone and could possibly feel a bit of a stretch for shorter users (Below 5’3” in height). Overall we were delighted and surprised by the feel of the elliptical motion. Delighted mainly by the exceptional smoothness. Slightly surprised when you read on Sole’s spec sheet that the flywheel weight is 23lb / 10.5kg. It’s certainly a decent weight but commonly less than some competitors’ offerings. However this is not something that should deter anyone, because the fact remains that the smoothness experienced by an elliptical is only partly due to the actual weight of the flywheel. With the E35, factors such as the large flywheel diameter, the drive system, the high quality of components and precision engineering are all important contributors to the great overall ‘feel’ you can expect with this machine. The dynamic arms are examples of the precision engineering that we mentioned before. The bends and angles that meander along the length of the handles are a good indication of the research (and craftsmanship) that went into creating the fluid, jerk-free movement. Aside from the natural, smooth, stable and silent way the machine glides, the E35 has another trick up its sleeve that isn’t apparent at first glance….Taa Daaah! INCLINE!! Yes, at the press of a button a separate elevation motor sends the guide rails pivoting at the rear of the machine. The rollers are then travelling up and down at an angle of between 0 and 40 degrees giving a completely different elliptical arc. The best part is that as well as upholding the safety of your ankle, knees and hip joints, you can also enjoy a totally unique sensation in your leg muscles! The E35 offers plenty of options for controlling the action. On the dynamic handles you have thumb controls for quick adjustment. At the top of the left handle are up and down buttons to adjust the angle of incline and on the right, are controls to alter the resistance levels. Talking of which, there are 20 levels of smooth, gradual resistance, from easy to ouch! But beware, it does seem to take a few seconds for the computer to register commands and for the resistance to kick in on this machine so don’t let your thumbs get ahead of yourself! The static handles house the pulse grip sensors. Although we always encourage the use of a wireless chest transmitter to achieve more accurate readings from the inbuilt receiver, this model also has the incentive of offering 2 heart rate controlled programs for anyone with a chest belt too. With regards to the various programs available, it’s quick and easy to see what’s on offer and make your selection, as each one is clearly labelled on one of the 10 buttons below the display screen. The choice is rather limited, (which is typical of Sole machines), but on the flip-side, you do have 2 user programs as part of the menu which allows you to create and store your own programs. In effect, this means that over time you can enjoy as many different workouts as your imagination can create! If you’re not feeling quite so imaginative, then the standard pre-set menu of Manual, Hill, Fatburn, Cardio, Strength and Interval should keep boredom at bay. The layout of the console is very clear and being as each of the programs has its own button allocated to it, setting up is child’s play. At the very top of the console is a ‘cooling fan’. However, it strangely only seems to blow a faint wisp of air sidewards(?) so the only way it could offer any cooling effect is to your hands if you hold the dynamic handles! This feature is quite literally a waste of space. Without it, the E35 could perhaps have benefitted from a bigger screen which would have been far more useful. As it is, there is a 6.5” screen that is certainly adequate and clear enough at displaying all of the necessary training feedback. Either side of the fan vents are the stereo speakers, which were fortunately far more effective at pumping out sound than the fan is at blowing out air! Just above a generous accessory storage holder at the base of the console are jack plugs for your MP3 player or your headphones. 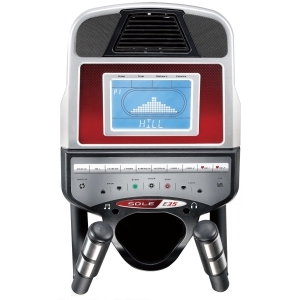 The headphones socket is a nice touch for ensuring that your workouts don’t disturb anyone – which, after all, is one of the advantages offered by cross trainers above machines such as treadmills. The Sole E35 is not currently available from any retailers we're aware of in the UK. Maximum user capacity of over 26 stone. Warranty: Lifetime frame, magnetic braking, parts. 3years labour.